There are two types of people: those who eat pizza crust and those who don’t. But the lines might blur at Beebe’s, a new all-day restaurant in Long Island City where pools of mozzarella spill over the cornicione, the proper term for crust, so say pizza freaks. Even for haters, it’s a hard crust to resist. Lou Tomczak, Beebe’s pizza chef, knows exactly what he’s doing. After slinging pies at Greenpoint’s beloved Paulie Gee’s, Tomczak helped open Williamsburg’s Emmy Squared in 2016 (as a partner and chef, the crispy and square, Detroit-style pies were an instant sensation). 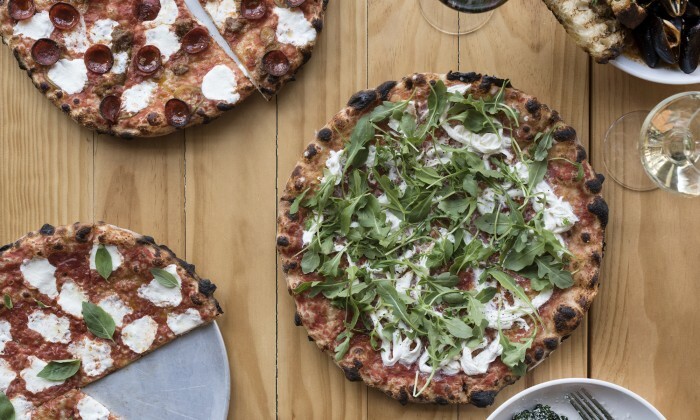 Tomczak parted ways with Emmy Squared, which is a much-needed boon for one of NYC’s fastest-growing neighborhoods—finally, Long Island City has pizza with pedigree. As for the ingredients themselves, Tomczak isn’t getting carried away, mostly sourcing close-to-home flavor. 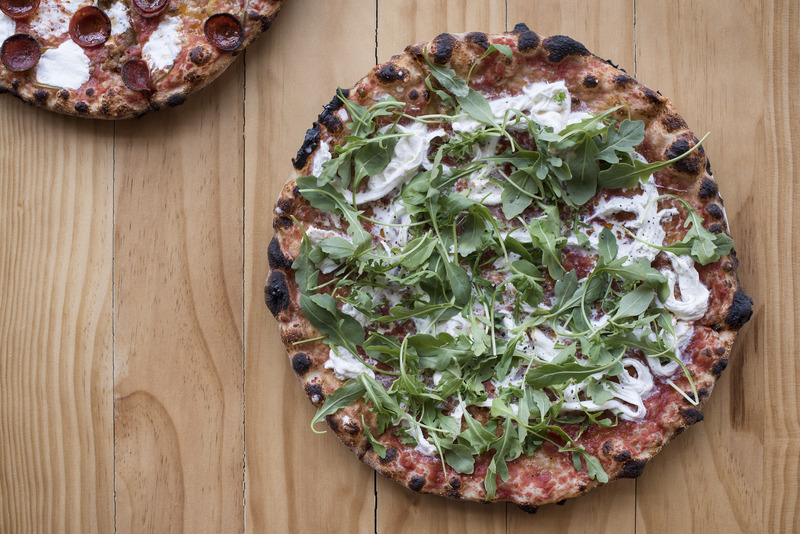 The ricotta is made in-house and the mozzarella is produced around the corner in Astoria. 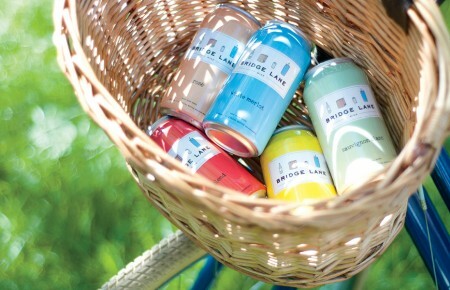 He’s keeping it simple and letting certain ingredients shine, even some from the North Fork. “Satur Farms provides a super peppery and crisp arugula that makes a couple of our pies pretty special,” he said. Tucked in the back of the Boro Hotel, Beebe’s keeps pace with the design-forward boutique. The restaurant is spare but not simple, and opens up to a bright, sun-drenched space with playful touches. Expect tiled walls shaped like backgammon boards and mid-century-style chairs with red accents that match the bright dome of the Italian pizza oven. Chef George Mandakas rounds out the rest of the all-day menu with surprising ingredient-driven dishes, and a full-scale bar has on-tap Negronis for the soon-to-open outdoor courtyard. 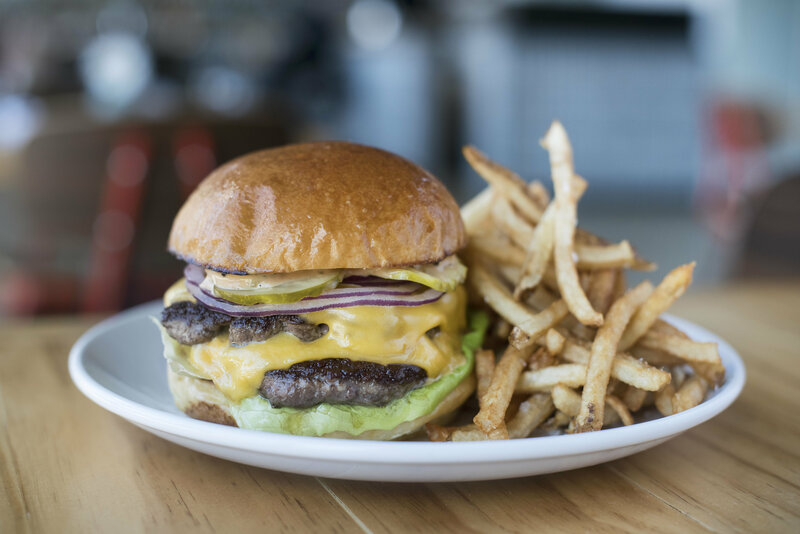 All of this is to say that, especially if you’re spending the night, there’s a new classic in LIC with some must-try dishes—and they aren’t only pizza. 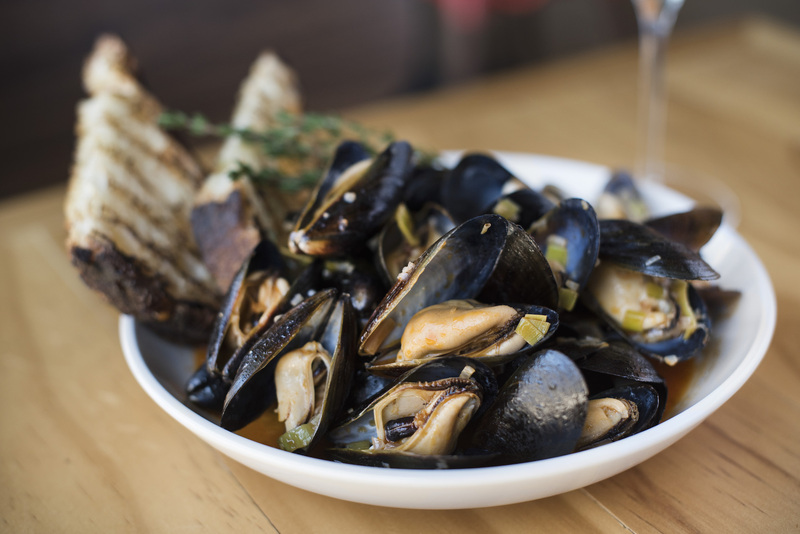 Even if you don’t usually like mussels, there’s a lot to love about these mussels. Mandakas, recalling his early years as a home brewer, skips the traditional white wine for a bright and bittersweet pilsner broth, which steams Prince Edward County mussels. The broth, accented with lemon thyme, leeks and shallots, is finished with Mandakas’ housemade Calabrian chili hot sauce. “The only problem I’ve had with the dish is that I keep getting asked for extra bread to soak up that broth!” said Mandakas. A nod to the star ingredient, which laced pies at both Paulie Gee’s and Emmy Squared, honey makes an appearance in Tomczak’s Hot Italian. Far from sweet, it gets its name just from the pickled chili, hot Italian sausage, pepperoni and the nector itself, a spicy drizzle of Mike’s Hot Honey (it’s infused with chilies). As for the crust, Tomczak thanks his Italian oven for the classic flair. “The pizzas are baked in an Italian gas oven capable of reaching a higher temperature than most gas ovens. I wanted to approximate the bake of a coal oven without having to use coal. It’s not the same but it gives similar results,” he said. Some might question the slick of milk that Tomczak’s housemade stracciatella leaves behind, as if the crust drooled all over the platter. Others might prefer that the shredded cheese was served piping hot—the mozzarella is so melty that it’s added after the pizza comes out of the oven. But if there’s one mouthwatering pie on the menu, it’s by far the creamiest of the lineup with a bite from fresh arugula and cracked black pepper. 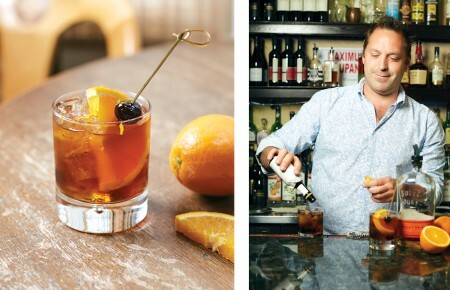 Beebe’s least popular cocktail is only so by default—staff suspect that guests raise an eyebrow after seeing Maraschino liqueur in the ingredients. 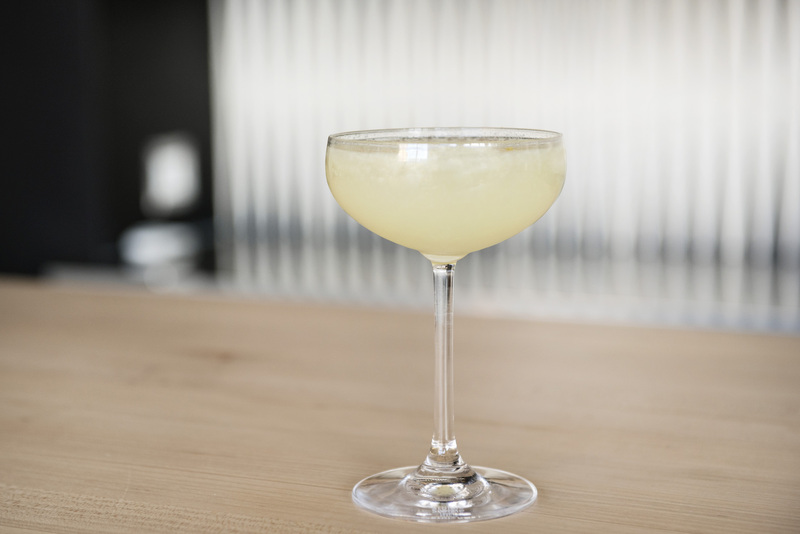 The cocktail itself is a smooth variation of the Hemingway Daiquiri. 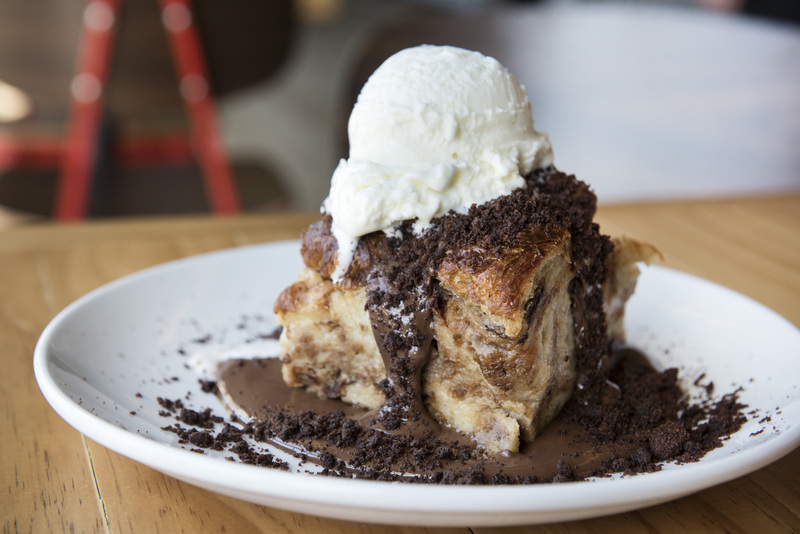 Thick squares of bread pudding oozing with Nutella sauce—need I say more?